As often acknowledged, humanitarian demining is mainly a gardening process. Because of its intrinsic threat, it requires extreme care, but the tools and the machines used for demining are very similar to equipment used in agriculture as the aim in the end is always ground processing. So why not using locally available agricultural technologies for helping humanitarian demining activities? They are widely available and easily repairable everywhere in the world. Moreover, we think that investing resources in research into agricultural equipment will help mine affected developing countries to better approach climate change challenges. Mechanical technologies available on the humanitarian demining market are heavily armored and extremely expensive, the price of the cheapest machine being approximately 120.000 US$. Instead, Disarmadillo is built around a small two wheel tractor and is designed to be as cheap and locally sustainable as possible. 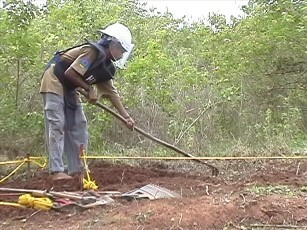 To keep it simple, it is aimed to work in close relationship with manual deminers; its task is limited to process the ground and lift on soil surface landmines that will be later removed manually (when used with the raking tool) and cut and remove vegetation (when used with the vegetation cutting tool). For a complete list of requirements please scroll down this page. Snail Aid team has a long experience into technologies for humanitarian demining matured both in numerous field visits around the world and in active involvement in many international research projects. Disarmadillo project represents the second design iteration of the PAT for humanitarian demining machine, developed by Emanuela at the PMAR lab of the University of Genova (during her PhD thesis) in collaboration with many partners, through participatory and collaborative design. To have an overview on the project and the philosophy behind it, please take a look at the video of the presentation we held at the ASEM seminar in March09.